Jeremy Hunt said it was time to end the "historic imbalance" between mental and physical health services. But the Royal College of Nursing said the plans did not add up, and more "hard cash" would be needed if the new staff were to be trained in time. The government said an extra £1bn already promised for mental health services in England would fund the scheme - part of a pot of £1.3bn committed in 2016 to transform provision. These plans set out how some of that money will be spent - mostly on recruiting staff, with the main focus being on child and adolescent mental health services, therapists delivering talking therapies for adults and nurses working in crisis care. 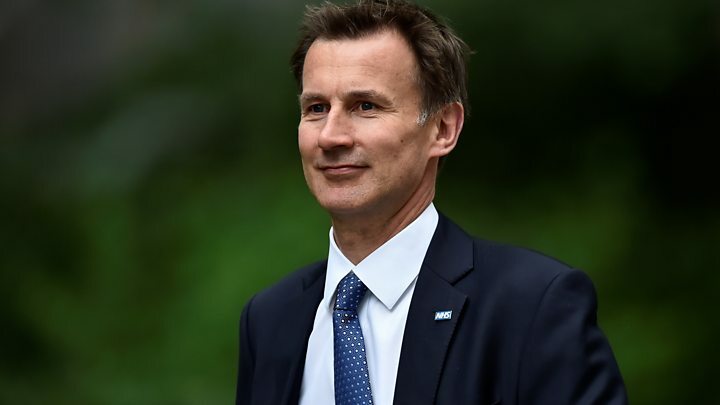 Media captionHealth Secretary Jeremy Hunt tells Today his mental health targets will be "challenging to meet"
Mr Hunt said: "We want people with mental health conditions to receive better treatment, and part of that means having the right NHS staff. "We know we need to do much more to attract, retain and support the mental health workforce of the future - today is the first step to address this historic imbalance in workforce planning." Mr Hunt said the measures were "ambitious" and amounted to "one of the biggest expansions of mental health services in Europe". However, Labour's shadow minister for mental health, Barbara Keeley, said the government was "promising only jam tomorrow, when what is needed is action today". "The workforce plan provides no real answers on how these new posts will be funded or how recruitment issues will be overcome," she added. "And it offers little hope to those working in the sector faced with mounting workloads, low pay and poor morale." "It's about having a motivated and skilled workforce in place to deliver the work we need to do." "You would expect to see a consultant if you had cancer and the same applies for mental health. "The biggest challenge to creating robust mental health services is the workforce. I am very supportive of this strategy which starts to tackle that problem." But Janet Davies, chief executive and general secretary of the Royal College of Nursing, said: "There is already a dangerous lack of workforce planning and accountability and this report is unable to provide detail on how the ambitions will be met. "It is clear the government will need to work hard just to get back to the number of specialist staff working in mental health services in 2010. "Under this government, there are 5,000 fewer mental health nurses and that goes some way to explaining why patients are being failed."